Janine Stange, also known as National Anthem Girl, is singing "The Star-Spangled Banner" in all 50 states by September 14, 2014, to celebrate the song&apos;s 200th anniversary and to honor our nation&apos;s heroes. On Thursday, July 10, she will check off Indiana as her 40th state by performing during the South Shore Regional Car Show. The South Shore Regional Car Show will be presented at Fair Oaks Farms from 3:00 p.m. to 9:30 p.m. on Thursday, July 10. In addition to Stange&apos;s rendition of "The Star-Spangled Banner," attendees can enjoy a DJ and music, an appearance by the Indianapolis Colts cheerleaders and the Colts In Motion traveling museum, a 1969 Nostalgia Top Fuel Dragster, a beer garden, discounted Fair Oaks Farms attractions and a fireworks show. While in Northwest Indiana, Stange will be available on July 10 for morning news segments and on July 11 for in-studio appearances. For more information, visit www.nationalanthemgirl.org. To schedule an in-studio appearance or interview, contact Stange at info@nationalanthemgirl.org or by calling 516.810.4451, or contact Nicki Mackowski-Gladstone at nicki@southshorecva.com or by calling 219-989-7770. ONE SONG. ONE GIRL. 50 STATES. ALL IN THE NAME OF PATRIOTISM. Janine Stange, also known as The National Anthem Girl, made history once when she was invited to sing the national anthem for MetLife Stadium&apos;s inaugural event, the Konica Minolta Big City Classic in April 2010. 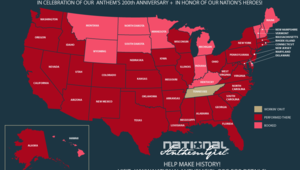 Now Janine&apos;s goal is to make history once again by performing the national anthem in all 50 states before September 14, 2014, which marks its 200th anniversary from the time Francis Scott Key penned the lyrics for the song. Born and raised in Long Island, NY, Janine Stange currently resides in Los Angeles, CA, where she founded the nonprofit National Anthem Girl. She performed "The Star-Spangled Banner" hundreds of times throughout high school, college and even during her career as a recording artist. In 2008, Janine released her third studio album, which was later distributed to iTunes and included a recording of the national anthem in an effort to honor America. Her goal to sing in all 50 states with National Anthem Girl originally started in 2012 as she was touched by those who give meaning to our nation&apos;s song, especially the men and women who serve in our country&apos;s military. Fueled by a desire to promote patriotism, Janine&apos;s mission didn&apos;t take much time to capture the attention of national media and local news outlets. On April 14, 2014, Janine appeared as a guest on Fox & Friends, America&apos;s #1 morning cable talk show, with hosts Elisabeth Hasselbeck, Steve Doosy and Eric Bolling. As part of her appearance, Janine was asked to sing the anthem on the national program, which reached millions of viewers and inspired many to donate and support her cause to help alleviate costs to travel to all 50 states. As a result of the Fox and Friends appearance, Janine was contacted to perform at other notable events such as the New Hampshire Motor Speedway NASCAR on July 13th, Detroit Tigers on August 16th and University of Hawaii football home opener on August 30th. Supporters were thrilled to learn that her performances also included a way for individuals and attendees to fill out blank "thank you" cards to express their gratitude for our military. Each card is then included in a care package sent by Operation Gratitude, a volunteer-based non-profit that annually sends 100,000 care packages to individually named U.S. service members, veterans and care givers. Past performances from Janine include singing the national anthem for: NY Knicks, NY Nets, Cincinnati Reds, Pro Bull Riders, MLL Championships, Tennis Hall of Fame, Patriot Tour with Marcus Luttrell, Monster Jam, AMA Supercross, Brooklyn Nets, LA Kings, LA Galaxy, NY Islanders, Georgia Tech, Xavier University, UCLA and more.